[S405] E-mail from Elizabeth Hampson to Stuart & Teresa Pask dated 12 April 2004 - List of PASKs in Sedgebrook Registers April 1665 - November 1836: "Baptism Henry Scott PASK son of Ann a singlewoman of Sedgebrook." [S2347] Image of the 1851 Census for East Allington, Lincolnshire: HO107 Piece 2138 Folio 137 Page 5. 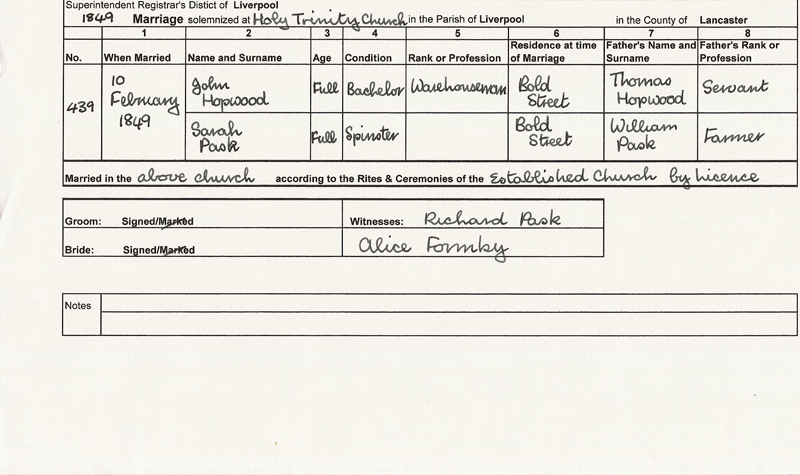 [S285] Website FamilySearch Internet (http://www.familysearch.org) : "England Births and Christenings, 1538-1975," database, FamilySearch (https://familysearch.org/ark:/61903/1:1:NGPJ-N7Z : 11 February 2018, Ann Pask, 29 Apr 1812); citing EAST ALLINGTON,LINCOLN,ENGLAND, index based upon data collected by the Genealogical Society of Utah, Salt Lake City; FHL microfilm 421,888, 505,767. [S384] Website FamilySearch Internet (http://www.familysearch.org) : Submitted by a member of LDS Church Batch Number: 7729407 Sheet: 52 Source Call No. : 1126141. [S2045] E-mail from Lucy Meyer-Hubner to Stuart & Teresa Pask dated 6 April 2006. [S5740] E-mail from Roy Eldridge to Stuart & Teresa Pask dated 19 August 2018. [S2346] Image of the 1841 Census for East Allington, Lincolnshire: HO107 Piece 0614 Book 1 Folio 4-5. [S2348] Image of the 1861 Census for 2 Welby Row, East Allington, Lincolnshire: RG9 Piece 2481 Folio 8 Page 10. [S2353] Image of the 1871 Census for East Allington, Lincolnshire: RG10 Piece 3544 Folio 7 Page 5. Enumerated under the name of PASK SCOTT. [S2349] Image of the 1871 Census for East Allington, Lincolnshire: RG10 Piece 3344 Folio 8 Page 7. Category Birth, Marriage, Death & Parish Records. [S4] GRO Indexes to Deaths. "1875/Q1 SCOTT, Thomas Newark 7b 300 age 68." [S2352] Image of the 1881 Census for New Row, Allington, Lincolnshire: RG11 Piece 3378 Folio 8 Page 9-10. Enumerated under the name of SCOTT. [S2350] Image of the 1891 Census for 2 New Row, Allington, Lincolnshire: RG12 Piece 2715 Folio 6 Page 6. [S416] Website Ancestry Civil Registration - Deaths: 1895/Q3 SCOTT, Ann Newark 7b 260 age 83. [S2345] E-mail from Malcolm Scott to Stuart & Teresa Pask dated 17 August 2006. [S405] E-mail from Elizabeth Hampson to Stuart & Teresa Pask dated 12 April 2004 - List of PASKs in Sedgebrook Registers April 1665 - November 1836: "Baptism John PASK son of William a labourer & Ann of Sedgebrook." [S405] E-mail from Elizabeth Hampson to Stuart & Teresa Pask dated 12 April 2004 - List of PASKs in Sedgebrook Registers April 1665 - November 1836: "Baptism Mary PASK dau of William a labourer & Ann of Sedgebrook." [S405] E-mail from Elizabeth Hampson to Stuart & Teresa Pask dated 12 April 2004 - List of PASKs in Sedgebrook Registers April 1665 - November 1836: "Marriage Mary PASK sotp = John STENNETT botp. Wit: James WEBB WING & Josh BURROUGHS By Banns." [S405] E-mail from Elizabeth Hampson to Stuart & Teresa Pask dated 12 April 2004 - List of PASKs in Sedgebrook Registers April 1665 - November 1836: "Baptism Richard PASK son of William a labourer & Ann of Sedgebrook." [S405] E-mail from Elizabeth Hampson to Stuart & Teresa Pask dated 12 April 2004 - List of PASKs in Sedgebrook Registers April 1665 - November 1836: "Burial Richard PASK infant of Sedgebrook." [S2395] Transcript of the marriage of Richard Pask and Frances Amelia Meatyard, 18 August 1851. Kindly provided by Susan Atkins - GOONS Marriage Challenge. [S3] GRO Indexes to Marriages. "1851/Q3 MEATYARD, Frances Amelia Derby 20 1005." [S3] GRO Indexes to Marriages. "1851/Q3 PASK, Richard W. Derby 20 1005." [S2399] E-mail from Caroline Meatyard to Stuart & Teresa Pask dated 20 November 2006. [S4] GRO Indexes to Deaths. "1855/Q4 PASK, Richard W. Derby 2b 345." [S405] E-mail from Elizabeth Hampson to Stuart & Teresa Pask dated 12 April 2004 - List of PASKs in Sedgebrook Registers April 1665 - November 1836: "Baptism Sarah PASK dau of William a labourer & Ann of Sedgebrook." [S405] E-mail from Elizabeth Hampson to Stuart & Teresa Pask dated 12 April 2004 - List of PASKs in Sedgebrook Registers April 1665 - November 1836: "Baptism Thomas PASK son of William a labourer & Ann of Sedgebrook." [S2416] Transcript of the marriage of Thomas Pask and Sarah Partington, 1 May 1845. Kindly provided by Susan Atkins - GOONS Marriage Challenge. 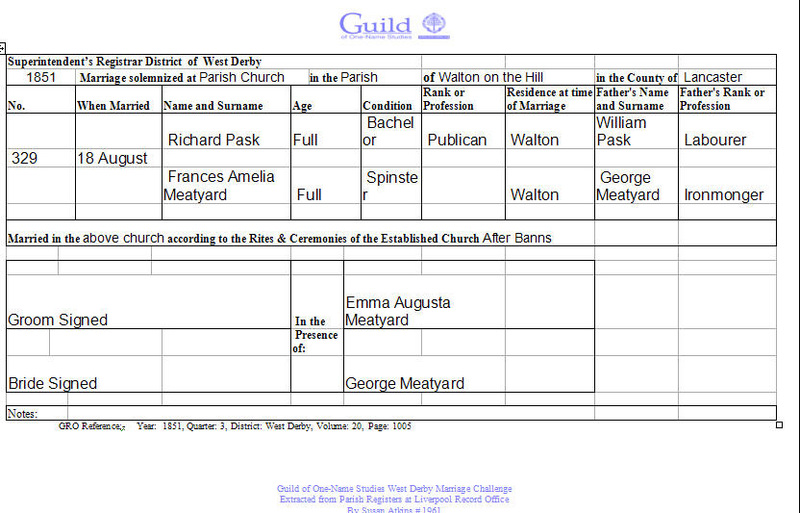 [S2415] Website Lancashire Births Marriages & Deaths (http://www.lancashirebmd.org.uk) : PASK Thomas PARTINGTON Sarah West Derby, St. Philip Liverpool 2024WD/6/263. [S2417] Image of the 1851 for Liverpool Road, Standfield, Great Crosby, Lancashire: HO107 Piece 2191 Folio 317 Page 5. [S4] GRO Indexes to Deaths. "1853/Q1 PASK, Sarah W. Derby 8b 312." [S3] GRO Indexes to Marriages. "1854/Q1 PASK, Thomas = SEED, Mary Fylde 8e 611." [S2415] Website Lancashire Births Marriages & Deaths (http://www.lancashirebmd.org.uk) : Marriage PASH Thomas SEED Mary 1854 Poulton-le-Fylde, St.Chad Preston FJ/1/306. [S4] GRO Indexes to Deaths. "1858/Q2 PASK, Thomas Liverpool 8b 32." [S2] GRO Indexes to Births. "1846/Q1 PASK, Ann Liverpool 20 415." [S2] GRO Indexes to Births. "1848/Q3 PASK, Ellen Liverpool 20 289." [S2418] Image of the 1861 Census for 93 Gt Howard Street, St. Martin, Liverpool, Lancashire: RG9 Piece 2656 Folio 72 Page 7. [S406] Image of the 1861 Census for Sedgebrook, Lincolnshire: RG9 Piece 2481 Folio 118 Page 1. [S6] Teresa & Stuart Pask's Guesses, Theories and Speculations: Based on the fact that they were listed in the same household in the 1851 & 1861 census. [S410] Website Sedgebrook inhabitants of yesteryear (http://myweb.tiscali.co.uk/hampson/index.htm: ). [S2250] Image of the 1851 Census for Sedgebrook, Lincolnshire: HO107 Piece 2138 Folio 199 Page 7 HO107 Piece 2138 Folio 158 Page 8. Indexed incorrectly under the name of PARK. [S2] GRO Indexes to Births. "1846/Q4 PASK, Ann Firmage Newark 15 538." [S272] Website GENUKI (http://www.genuki.org.uk) : http://www.genuki.org.uk/big/eng/LIN/bastardy_1847.html: "Grantham Petty Sessions 15 January: Jas FURMIDGE, of Sedgebrook, consented to pay 1s 3d in an affiliation case: the Magistrates allowed the small sum in consequence of the female (Susanna PASK) having previously had a child." and Ann beloved granddaughter of above died March 21 1868 aged 21." [S410] Website Sedgebrook inhabitants of yesteryear (http://myweb.tiscali.co.uk/hampson/index.htm: ) Church of St Lawrence Memorial Inscriptions: "In Affectionate Remembrance of Ann wife of William Pask who departed this life May 2nd 1869 aged 75 years." [S417] Website Ancestry Civil Registration - Marriages: "1852/Q4 PASK, Henry Scott Newark 7b 543 = Elizabeth REEK." [S409] Transcript of the 1901 . "PRO Ref RG13 Piece 3201 Folio 108 Page 2." [S3] GRO Indexes to Marriages. "1852/Q4 PASK, Henry Scott = REEK, Elizabeth Newark 7b 543." [S2354] Image of the 1861 Census for East Allington, Lincolnshire: RG9 Piece 2481 Folio 10 Page 13. [S2351] Image of the 1901 Census for New Row, Allington, Lincolnshire: RG13 Piece 3201 Folio 108 Page 2. [S2] GRO Indexes to Births. "GRO Online Index: 1853/Q3 SCOTT, Ann REEK Newark 7b 260." [S408] Website Dring Family Research (http://www.dring.org.uk/: ) 22 March 1874 - John DRING,27,bach, bricklayer, Elston, Notts, father Samuel James DRING, carpenter to Ann Scott PASK, 21, spins, East Allington, father - Henry Scott PASK, Labourer ent 66 at Parish Church East Allington, Lincs ( reg- Newark) JSM. [S3] GRO Indexes to Marriages. "1874/Q1 PASK, Ann Scott Newark 7b 415." [S2609] Image of the 1881 Census for Guild Hall Street, Newark, Nottinghamshire: RG11 Piece 3375 Folio 94 Page 8. [S2612] Image of the 1891 Census for 7 Barnby Gate, Newark, Nottinghamshire: RG12 Piece 2713 Folio 110 Page 6. Indexed incorrectly under the name of DING. [S2611] Image of the 1901 Census for 21 Barnby Gate, Newark, Nottinghamshire: RG13 Piece 3197 Folio 120-1 Page 6-7. [S2610] E-mail from Kate Hurst to Stuart & Teresa Pask dated 15 June 2007. [S2] GRO Indexes to Births. "GRO Online Index: 1876/Q3 DRING, Charlotte Harriet SCOTT Newark 7b 389." [S2] GRO Indexes to Births. "GRO Online Index: 1878/Q4 DRING, John William SCOTT Newark 7b 382." Research Note: No GRO Birth found. Also not found in 1881 census, or other record found in FamilySearch. [S4979] Image of the 1901 Census for 14 Granville Street, Idle, Bradford, Yorkshire: RG13 Piece 4185 Folio 112 Page 11. Indexed incorrectly under the name of Enumerated as SCOTT. [S5502] Website FindmyPast: 1939 Register: RG101 3347C 005. [S3] GRO Indexes to Marriages. "1881/Q4 PASK, William Scott = PARK, Mary Ann Darlington 10a 28." Record set England & Wales Marriages 1837-2005. [S4] GRO Indexes to Deaths. "1948/Q1 PASK, William S. Bradford 2b 184 age 92." [S2] GRO Indexes to Births. "1888/Q4 PASK, Mabel Elizabeth Bradford, Y. 9b 86." [S2] GRO Indexes to Births. "1890/Q3 PASK, William Edwin Bradford, Y. 9b 52." Research Note: No birth found for Lucy Scott Pask in GRO Birth Index. [S3] GRO Indexes to Marriages. "1891/Q2 PASK, Lucy Scott = STEVENSON, Richard Edward Newark 7b 563." [S2613] Image of the 1901 Census for Great Hale, Lincolnshire: RG13 Piece 3050 Folio 73 Page 13. Enumerated under the name of STEPHENSON. [S2] GRO Indexes to Births. "GRO Online Index: 1859/Q1 PASK, John REEK Newark 7b 310." [S4] GRO Indexes to Deaths. "1884/Q4 Lincoln 7a 331 age 26." Research Note: No GRO Marriage or Death record (before 1909) found. Also searched 1881 census, but nothing found. [S2] GRO Indexes to Births. "1861/Q1 PASK, Harriet Newark 7b 301." [S408] Website Dring Family Research (http://www.dring.org.uk/: ) "22 March 1874 - John DRING,27,bach, bricklayer, Elston, Notts, father Samuel James DRING, carpenter to Ann Scott PASK, 21, spins, East Allington, father - Henry Scott PASK, Labourer ent 66 at Parish Church East Allington, Lincs ( reg- Newark) JSM." Research Note: No birth found for Elizabeth Dring in GRO Birth Index. [S2] GRO Indexes to Births. "1880/Q4 DRING, Henry Scott Newark 7b 382." [S2] GRO Indexes to Births. "1874/Q1 PASK, Mary Elizabeth Newark 7b 381." [S2] GRO Indexes to Births. "GRO Online Index: 1874/Q1 PASK, Mary Elizabeth REEK Newark 7b 381." [S3] GRO Indexes to Marriages. "1893/Q2 PASK, Mary Elizabeth S. = BETT, Maddison Newark 7b 719."